How To Make Paper Mache Easter Eggs! Are you looking for awesome easter crafts for kids? 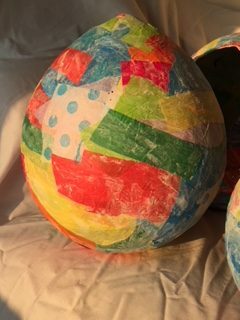 Would you like to know how to make paper mache easter eggs?! These eggs are a super fun easter craft idea to make together as a family! Easter is a great opportunity to make crafts with your kids! Or to make crafts with your grandkids! This easter egg craft was actually created by my mom. 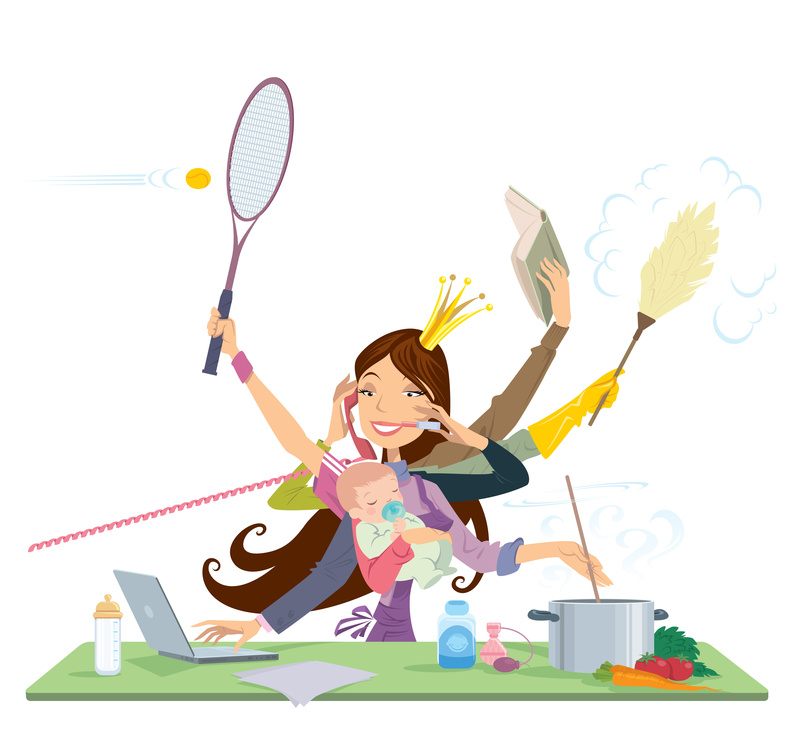 She loves to do fun crafts and activities with the kids and the kids have a blast making them! So, after seeing how incredibly cute these paper mache eggs were, I asked her if I could share it with you! Simply combine 2 parts water with 1 part flour. 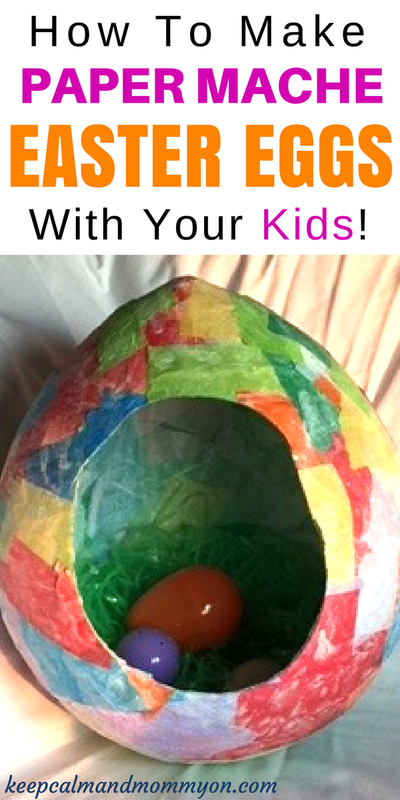 The steps to make paper mache easter eggs are pretty simple, however it is a messy project! I would recommend making these on a table with a disposable cloth on it. Or even making them outdoors on a porch! 1. Start by blowing up the balloon and tying it off. 3. Apply several layers of tissue paper to the balloon using the flour paste. You can either paint the ballon with the paste before applying the tissue or you can rub it on with your hands. Honestly, its faster using your hands, however it is messy. So totally your call! Apply more paste over the strips. 4. Apply several layers of newspaper strips over the strips of tissue paper. Make sure to paint flour paste on the balloon before and after each layer. 5. Next add more layers of tissue paper strips on top of the newspaper. Be sure to add flour paste before and after each layer. There is no set amount of layers that you need to add. At this point you basically need to add enough strips to cover the newspaper so that you can’t see it through the tissue paper. 6. Let the egg dry. This could take a day or so. Also, after letting the egg dry, you might discover that there are spots that are thinner than others that need more tissue paper added. If this is the case add more flour paste and tissue paper as instructed above and let dry again. 7. Once your egg is completely dry you can cut a hole in the side as shown in the pictures using scissors. 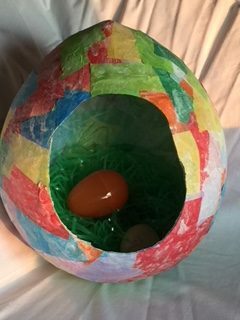 Fill your egg with easter grass and plastic easter eggs for decoration and set out your child’s beautiful paper mache easter egg to display! 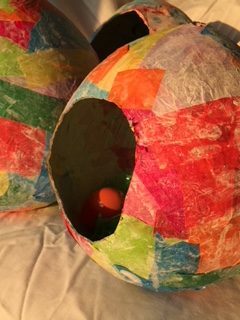 And that’s how to make a paper mache egg! « 10 Must Have Sensory Toys For Kids!